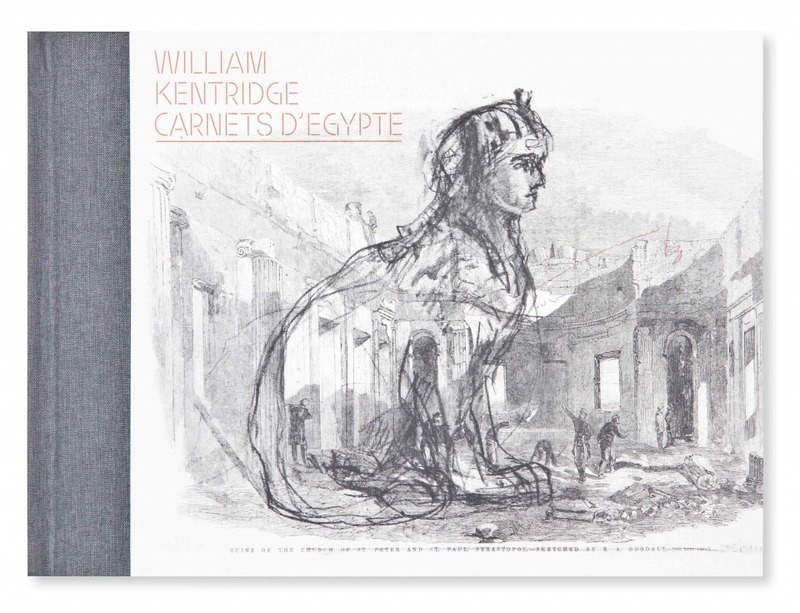 Exploring the imaginarium of Ancient Egypt as seen by century old travellers, William Kentridge gathers a serie of drawings and screencaps from his animation films. His drawings made on sheets of paper found here and there or directly on books confront his internal geography to the important collections of relics stored in the Louvre : the Scribe, the Sphinx, the Scribble Cat or even the Mausoleum echoes in drawings of artists and travellers – ruins, pyramides, explorators, transformation of lion-cat made by Carraci, Degas, Le Brun or Crapelet. The book is completed by the text Isis Tragedie, inspired by the Isis of Lully, along with unpublished notes by Kentridge in which he writes about the Egyptian figures who nourrished him and his work. A DVD containing three news movies by the artist also comes with the book. The installation « Carnet d’Égypte » was presented in 2011 at the Louvre in the department of Graphic art and Egypt Antiques. A limited edition of this book, numbered & signed by the artist, containing an original engraving is also available.